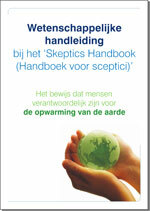 A Scientific Guide to the 'Skeptics Handbook' is now available in Dutch. Many thanks to Kristof Vandoorne who did the translation. Note - the Scientific Guide has also been translated into a few other languages, shown below. If you're interested in helping translate the Guide into another language, you can download the Word document, translate it and email me the translation. I'll then insert the translated text into the existing design and email back a PDF to check that it all came out right. But best first to contact me to ensure noone else is already working on your language (versions in Danish, Portuguese and Japanese are close to completion). UPDATE 26 Oct 2010: The Dutch podcast Kritisch Denken (which means "critical thinking") has done a podcast about the Scientific Guide to the Skeptics Handbook, using the Dutch translation as a reference. Many thanks to Jozef Van Giel - I hope to see this happen more in other languages.